It was twenty years ago, that United Artists released a 119 minute motion picture that told the poignant story of a two-bit Philadelphia club fighter Rocky Balboa (played by actor Sylvester Stallone) who gets his million-to-one-shot for fame and a chance to fight the world heavyweight champion for the championship belt. That film was directed by John G. Avildsen and the film script was written by Stallone himself. Also starring in the 1976 boxing motion picture were actors Talia Shire, Burt Young, Carl Weathers, Burgess Meredith and Thayer David. And twenty years to the exact date that Rocky was released, November 21st, those words were fulfilled when five nations represented by the Inter-Governmental Philatelic Corporation (IGPC) of New York City issued stamps for the Rocky series. The Five Nations participating in this unique philatelic tribute to one of the great movie series of all times are The Gambia (Rocky,) Ghana (Rocky II,) Uganda (Rocky III,) St. Vincent and the Grenadines (Rocky IV) and Grenada (Rocky V). In the twenty years following this major milestone in cinematic history, Rocky and its subsequent four sequels have won the hearts of hundreds of millions of movie fans in all parts of the world. To date, box office receipts for all of the Rocky films have surpassed the one billion dollar mark. A special first day of issue ceremony of the IGPC orchestrated Five-Nation Rocky films was held in the fancy Planet Hollywood restaurant in Manhattan. It was perhaps the first time ever that a series of stamps honoring the achievements of one individual (the acting talents of Sylvester Stallone) was ever unveiled by the actual subject of the stamp salute himself. Even those large stamp salutes to members of the British Royal Family have not been graced by the particular royal subject being celebrated on the stamps. At the Planet Hollywood celebration of Sylvester Stallone’s Rocky motion pictures, Keith Barish, the chairman of the 54 chain restaurant located around major metropolises in the world and partly owned by Stallone, recalled how Stallone with his script in hand went out to Hollywood twenty years ago, trying to get United Artists to back his cinematic venture financially. Stallone recalled how the top management at United Artists after looking at the script, agreed to finance the film. But, they warned him not to have too great hopes for the film, which they thought they might be able to distribute to the secondary drive-in theaters. Of course, the incredible world popularity for the Stallone Rocky films proved the predictions of the United Artist management wrong and Sylvester Stallone then a 30-year-old actor on the fringes of Hollywood obscurity got a new lease on his acting life. Indeed if one would try and analyze why the motion picture character Rocky Balboa has become endeared to movie goers in the USA and around the world, perhaps the answer is to be found in Sylvester Stallone’s memorable acting that created a personality that everyone can partially identify with and strongly root for. Rocky Balboa stands for the average guy who wants to lead a decent life and be the best he or she can be. The Philadelphia club boxer symbolizes everyone who has at anytime in their life been faced with seemingly impossible obstacles and yet refused to just give up. Instead, against imposing odds, Rocky represents the silent dreams of peoples of all faiths, nationalities, ethnic backgrounds and economic classes to fight the good fight and just maybe pull off the great upset and win back the eye of the tiger. The commission for designing the stamps, the very first time that a living individual, other than a member of the Royal Family has been honored with stamps from multiple countries, was awarded to the artist Shannon. Based in Toms Rivers, New Jersey, the new Rocky motion picture philatelic salute are her very first stamp designs. Her high profile illustrations have however appeared on many items ranging from clothing and children’s books to album covers and guitars for the rock group Cheap Trick. Each of the five nations participating in the stamp tribute to actor Sylvester Stallone and the Rocky motion pictures, released a single sheetlet. Each sheetlet contains a unique stamp for a different Rocky movie. Each stamp is printed three times in the respective sheetlet. The five sheetlets each have a unique text that deal with the particular Rocky film highlighted on the particular sheetlet. The first sheetlet issued by The Gambia (containing three similar 10 dalasy stamps) honors the 1976 film Rocky that revealed the character of Rocky Balboa who won the hearts of tens of millions of movie goers by the power he demonstrated for his love a shy young woman and the diligent preparation by his veteran trainer. Rocky finds the courage to compete against the powerful champion, triumphing against all odds by somehow managing to go the distance in a most memorable and thrilling battle. The west African nation of Ghana sheetlet of three similar 2000 cedis stamps celebrates the 1979 movie sequel Rocky II in which Rocky Balboa takes on the champion again in a stunning rematch for the heavyweight crown. Initially deciding to retire due to injuries, Rocky marries Adrian and attempts to settle into family life. But as he tries to make a new start, he realizes that he can t escape his true calling. In the fight of his life, Rocky triumphantly defeats the champion in a euphoric struggle of non-stop excitement. Uganda, a former protectorate situated in east Africa released a sheetlet of three similar 800 shillings stamp that focused on the 1982 film Rocky III. In this movie, Rocky battles his most powerful adversary yet in perhaps the most exciting and fast-paced film in the series. 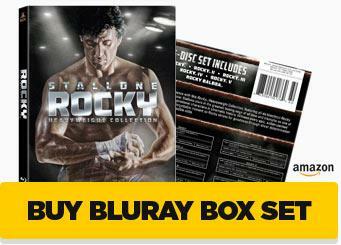 As the champion, Rocky scores ten consecutive victories and achieves worldwide fame. After losing his title in a knockout defeat, Rocky seeks to regain the “eye of the tiger” with the help of an old nemesis before his rematch for the heavyweight title. In a grueling and epic contest, Rocky manages to dramatically recapture the championship. The Caribbean island nation of St. Vincent and the Grenadines has honored the 1985 Rocky IV film in which East meets West when Rocky Balboa takes on a powerful Soviet fighter in a war between nations, fought in the boxing ring. After training in icy Siberia for a globally televised match in Moscow, Rocky battles his opponent in a heart-pounding fight to the finish in which he emerges the victorious hero. The St. Vincent sheetlet contains three similar $2.00 stamps of Rocky as he appeared in the film. Concluding the Five-Nation philatelic salute to the Sylvester Stallone series of five Rocky films is the West Indian nation of Grenada that released three similar $2.00 stamps honoring the 1990 motion picture Rocky V.
In this film after returning home from his latest triumph, Rocky Balboa suffers severe financial losses and is forced to retire from boxing due to injuries. 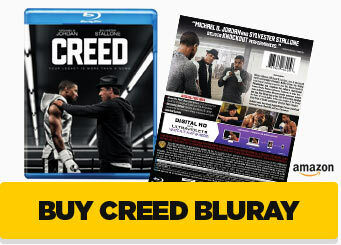 He and his family return to Philadelphia where Rocky trains a promising young boxer who rises to national prominence. When the young fighter turns again his mentor and publicly taunts him, Rocky knows he must fight once more to regain his dignity. This inspirational 1990 film brings the saga full circle. 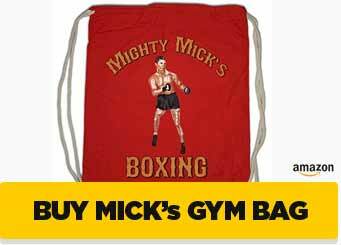 Screen-Used “Mighty Mick’s Gym” Sign at Auction!